This Tomato Campari Cocktail is the most gorgeous shade of red and is refreshingly delicious. Who would have thought tomatoes, fruit, and Campari would go so well together? It’s Friday and you need a drink. But you also need your veggies. And perhaps a fruit or two. But mostly, you need a drink. I made the executive decision that I didn’t have enough Campari in my life, so I purchased a bottle of my own to have at home. Best decision of the week. And let me tell you, I made a lot of decisions this week. Which is probably why I need a drink in the first place. Call me crazy, but when I saw 8 tomato cocktail recipes in Bon Appetit magazine, I was pretty obsessed. Right now is the BEST time to enjoy tomatoes and every time is the best time to enjoy cocktails. They’re not traditionally paired together, but why not? Tomatoes are always such a stunning color and they are, after all, a fruit. I’m sure the Campari and strawberries really boosted the red color of this drink, but it looks just like a tomato and that is alright with me. Plus, this is the best garnish I’ve ever had ever. While all 8 of the tomato cocktails looked splendid, I couldn’t resist the “Tango Till It Hurts” cocktail from Mathias Simonis. 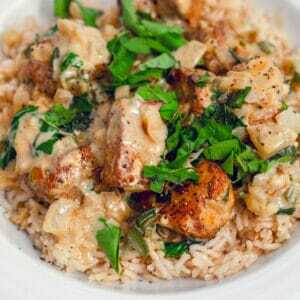 In part because of the name, in part because of the color, and in part because of the garnish. And in part because it’s a tomato Campari cocktail and who can resist that? Basically, there were a lot of “parts” for why I made this cocktail. I hope you won’t tango so much that it actually does hurt, but maybe just tango a little bit with one of these and I think your night will be made. 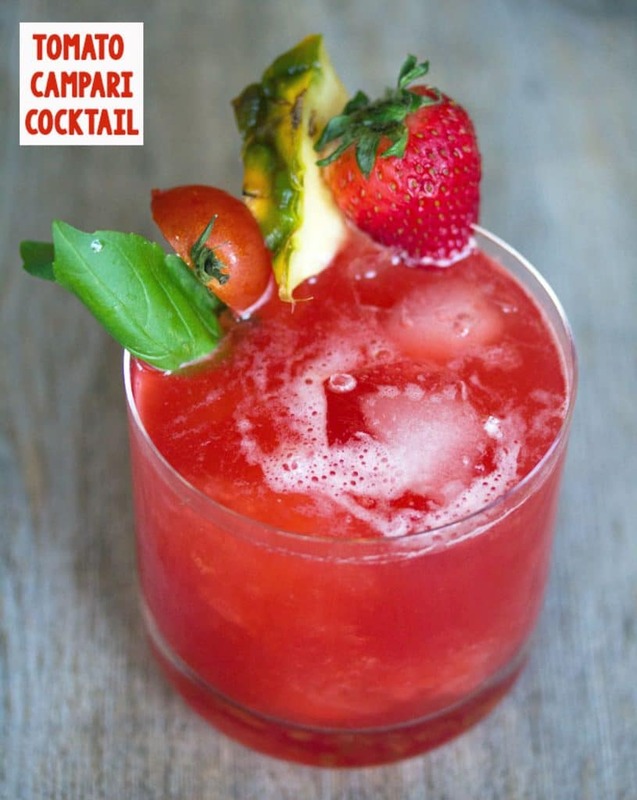 This tomato Campari cocktail is easy enough to make, but you have to know how to muddle! Put all the ingredients, aside from the Campari and garnishes, in a cocktail shaker and muddle them all up as best you can. You really want to get as much juice out of them as possible. Then, add the Campari to the shaker, put the lid on and shake, and strain into a glass filled with crushed ice. Top off with a splash of soda water. 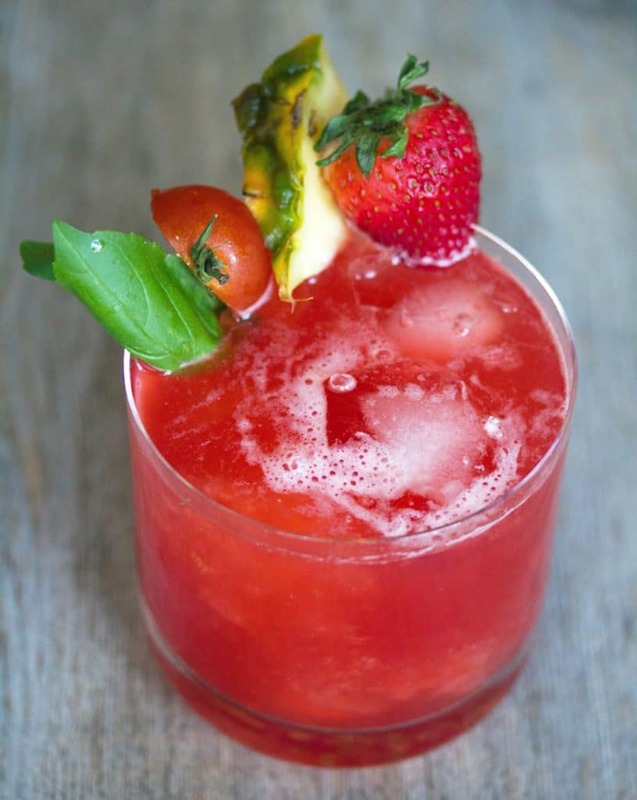 Garnish with a half a cherry tomato, a pineapple wedge, a strawberry, and a basil leaf or two. I mean, there’s nothing difficult about that garnish, but how fabulous does it look?? It makes me want to throw a party! 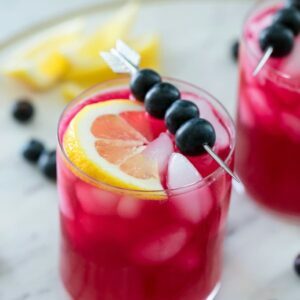 Let’s also talk about the color of this cocktail because yes. Thanks to the Campari, tomatoes, and strawberries, this is one of the prettiest colored cocktails I’ve ever seen. However, I almost want to try this same drink with a clear vodka instead, just to see what the color ends up looking like. Though you should trust me that the bitterness of the Campari is so, so good with the other fresh ingredients. And believe me, this is nothing like a bloody Mary. Though bloody Marys are one of my all-time favorite drinks, lots of people can’t stand them… This tomato Campari cocktail is absolutely nothing like that and is light, refreshing, and perfect for any time of the day. I hope you all had glorious weeks and are settling in for a nice, spectacular weekend. And, of course, I hope it involves a cocktail or two and maybe even a tango. But a couch is fine, too. 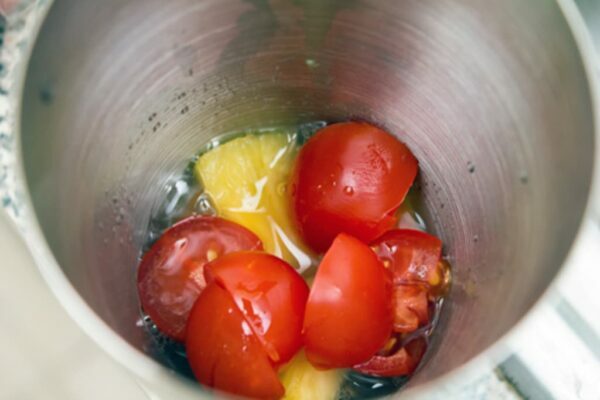 Have you ever included tomatoes in a cocktail? For more tomato cocktails, check out my Manhattan Dirty Bloody Mary Martini or my North End Margarita. 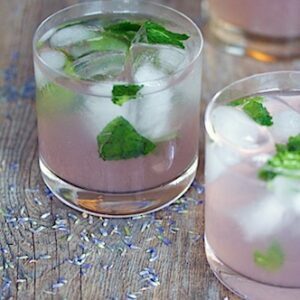 And I can’t wait to try this Mezcal Mary from Serious Eats! Put all ingredients, aside from the Campari and garnishes in a cocktail shaker and muddle them as best you can, releasing as much juice from them as possible. Add the Campari to the shaker, put the lid on and shake, and strain into a glass filled with crushed ice. Top off with a splash of soda water. 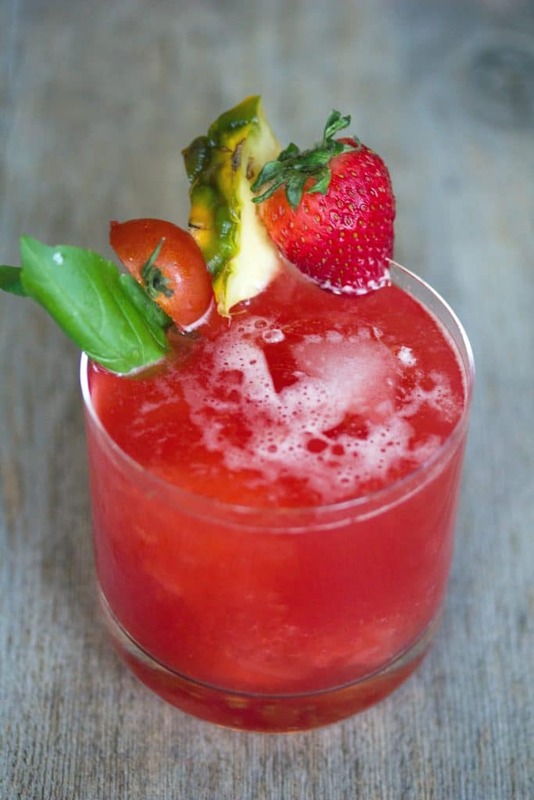 Garnish with a half a cherry tomato, a pineapple wedge, a strawberry, and a basil leaf or two. 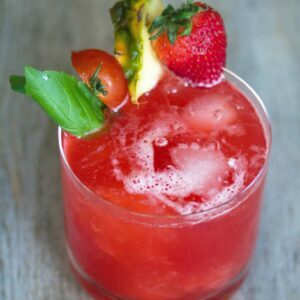 13 Responses to "Tomato Campari Cocktail"
“every time is the best time to have cocktails” – I LOVE the way you think! Also – tomatoes in cocktails. GENIUS. Oh wow, what a unique flavor. I absolutely love the idea. What a cute cocktail name. The color is gorgeous and it looks so refreshing. I don’t think I’ve ever had a tomato cocktail before (besides the obvious Bloody Mary). Woah, it IS pretty! I’ve never used tomatoes in anything but a bloody mary, but I’ve been inspired now. So interesting the combination of tomatoes and fruits…such a refreshing look…and so pretty. Never would have thought to do this, but I’m liking the sound of it! 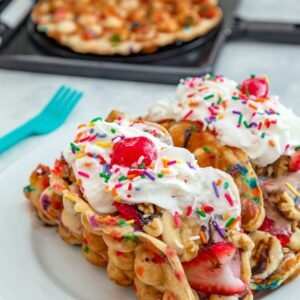 Maybe you will make this for me when I come sit on your roof deck…looks amazing and I will say the same when I sip this! This sounds awesome! Love it! This looks so refreshing. I have never seen a sweet drink with tomato, but I am intrigued and thrilled that it does not taste like a bloody mary. I hate anything that tastes like V-8 or spicy tomato sauce, at least as far as drinks go. Gotta be sweet:-) I definitely need to try this.